Following the completion of the Plimmerton railway station restoration project the team applied for and received a grant of $1,000 from the Historic Places Trust to establish ‘A permanent historic photograph display’ at the station. The project team is presently looking at display options and also starting to search for appropriate photos and stories. It is planned to launch the permanent historic display on 10/10/2011, exactly one year after the reopening of the station. We already have been supplied with some good examples. 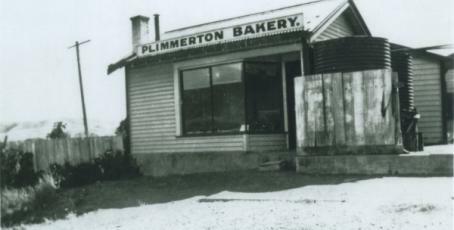 Plimmerton Bakery established about 1922 in Steyne Avenue by A.L. Cochrane. Photo supplied by Geoff Cochrane. A more detailed item to follow. 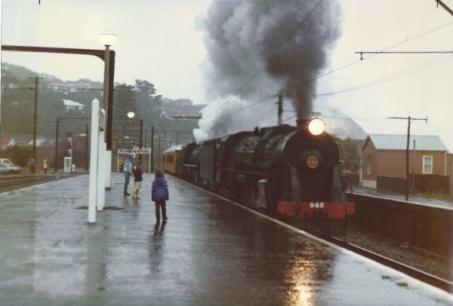 ‘Steam on a Rainy Day’ photo taken in 1985 shows the re-introduction of steam on the Wellington to Paekakariki section of the main trunk line. 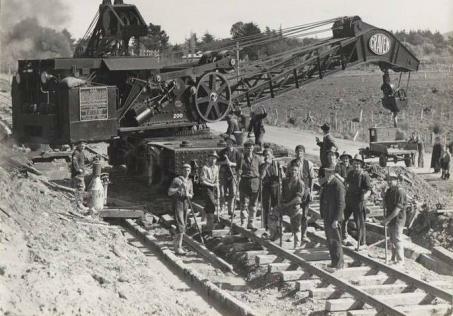 A construction crane working on preparing for double tracking on the Main Trunk Railway. Can you pick out the supervisor in the photo? 1939 JD Buckley collection. Here’s a photo of the new Dolly Varden (Mana) station about 1940. Electrification of the Main Trunk line has been completed from Wellington to Paekakariki. JD Buckley collection. First from a box of 1930’s photos taken by a gifted amatuer photographer, John Buckley. 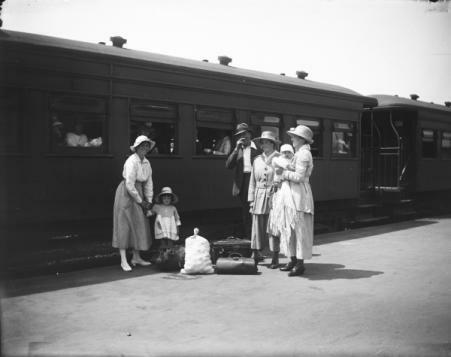 John David Buckley was a NZR train driver with a passion for photography. 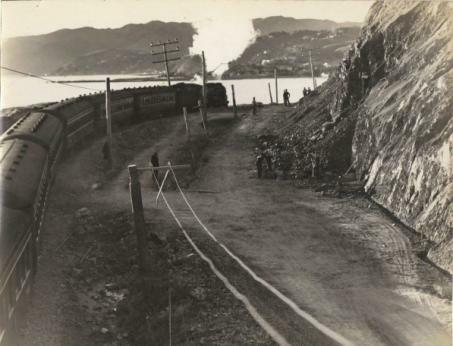 While the Buckley family was living in Paekakariki he took many photos of the construction 1934 – 1940 of the Paremata/Plimmerton/Pukerua/Paekakariki road (Centennial Highway) and the double tracking and electrification of the main trunk railway to Paekakariki. This photo from 1936 shows Goat Point with a view north to Plimmerton. A Steam locomotive pulls a passenger train pass the workers. Plimmerton was a favourite destination for Christmas Holidays. 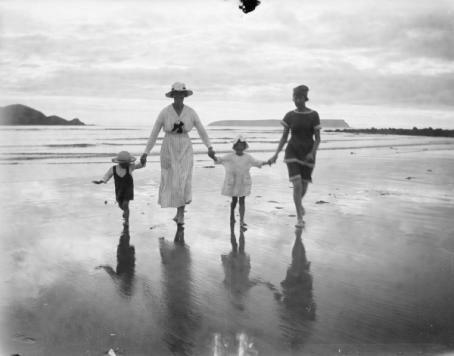 The Adkin family travelled down from Palmerston North February 1920 for a holiday at Plimmerton’s main beach. 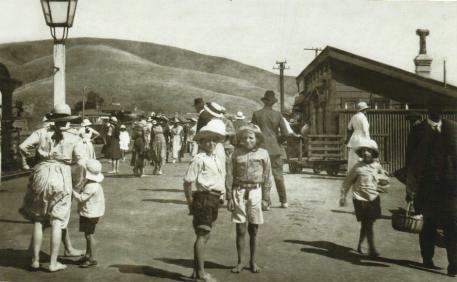 Adkin party arriving on Plimmerton Railway Station – 2 February 1920. 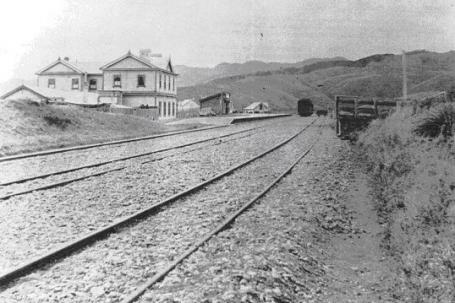 Photo from about 1895 is of Plimmerton railway station viewed from where the present station is now located. Sourced from Porirua City Council files. This photo from 1914 – 1916 shows the first railway station looking south. The eldest son of the stationmaster, Mr O’Sullivan, is pictured with his cousin. Sourced from a private collection. 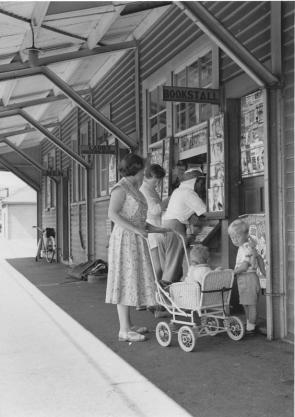 1960’s photo looking east out of the Plimmerton Station waiting room toward SH1. 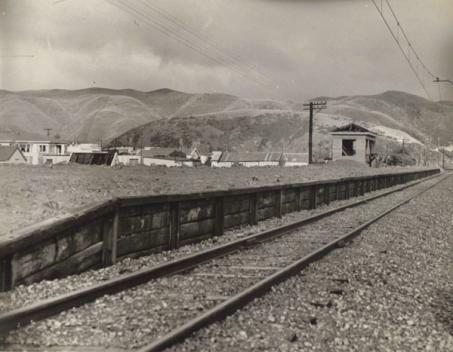 This was a busy siding with freight wagons from Winstons and other freight coming into Plimmerton by rail. The wagon is thought to have Winston Clay on it. 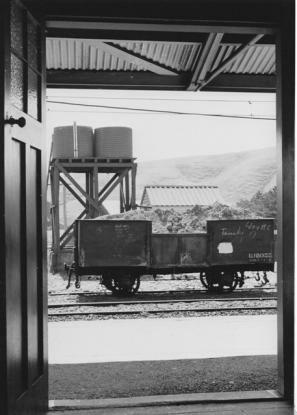 1956 photo used by NZ Rail publicity. The photo has been dated to February 1956 as there is an advertisement for Leap Year Art Union, the last of its type before Golden Kiwi replaced the older form of lottery. 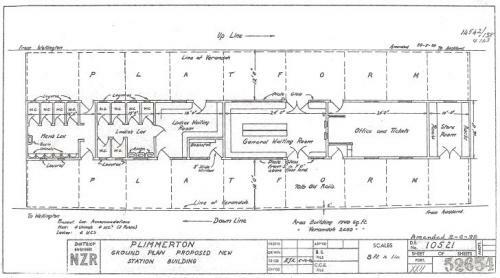 Diagram of the original (and as found during refurbishment) layout of Plimmerton Station construction 1939 – 1940.